David Nycz grew up [and graduated] in Hermiston, Oregon. He was 6th of 7 in Catholic family where dad was a security guard at a chemical weapons depot and mom was a nurse at the local retirement home. This family of 9 filled the same pew every Sunday as members of the local Catholic church which experienced a charismatic revival in the 80’s. David found the presence of God, and experienced love, fellowship and mentoring that drew out a leadership gift. In school, his church youth group, and at summer camps, friends and teachers often chose him to share their confidences and lead their activities. He was the model Catholic boy who talked with God as a child and grew up in a spirit-filled environment of weekly prayer meetings, youth fellowships, and conferences that included healing and prophecy. David was a Keith Green fan who enjoyed music and started college as a music major taking a heavy work-load of music classes. He very quickly noticed that he didn’t share the same level of passion for music as the other students, and switched his major to elementary education. His BA is from Western Oregon University where in this same time period he met and married Koi. His first teaching job in 1997 was within sight of the Oregon coast at Neahkahnie. He had a great mentor and teaching team to work with. Here he touched on his calling in teaching middle school students. In 2003 David read the Complete Wineskin and followed it by reading Releasing Kings. David immediately accepted the invitation to be promoted from servant to king in his “metron” of the marketplace: his classroom and school. Slowly, the school culture began to view David’s creativity and kingdom boldness as “rocking the boat” so, after 10 years at the same school district, he relocated and took a job near his home town in a district that celebrated his initiative and innovation with students. He was teacher of the Year in Oregon for 2010, an amazing accomplishment. By this time he had his Master’s degree in Educational Leadership and a beautiful family of six. That following year, he introduced himself for the first time to John Garfield at a summer conference and they went out for a lunch that led to a conference in David’s hometown, a friendship, and the shared vision to release kings in/from the education mountain. Throughout his youth and professional life, people have sought out David for conversation, and respected his faith, faithfulness and integrity. David has an ability, which starts with listening, to help people to connect with new concepts. He often hears, “David, you explained that really well.” He loves conversation, collaboration and developing his team of students and teachers. He loves the concept of learning, exploring new educational innovations, and more effective ways of doing things. He loves people and he loves being a teacher. When he read Releasing Kings he gave himself permission to be a leader and to bring change, even if it meant rocking the boat… something his new principal and education community appreciated and respected. His Master’s degree emphasis in 2010 was on teacher leadership, mentoring, and coaching, bringing positive social change to the education field. His heart is to transition teaching from a pro-dominant Ox-like methodology assembly line, pounding in information, to incorporate a balance of creative, relational leaders who release the unique Lion-heart genius in every student. He is, in effect, championing the concept of the Heart Plan in the education mountain with both teachers and students. David enjoys raising the ceiling and taking some risk to see kids light up. He adds excellence in education that can’t be achieved through a textbook, an administration hierarchy, following educational gurus, or an assembly line approach to passing students along. David goes to the root of “effective long-lasting learning” in order to later see good fruit in the achievement and growth of his students. His skill-set often draws others to ask about his approach and he loves reciprocation-collaboration: drawing great ideas from others that he can use as well. Maintaining the attention & interest of students is the #1 challenge for educators. Instructors who fall into the trap of dispensing information and routine drill & practice, practice sheets, and testing for results, lose the hearts and passion of their students. The resulting rebellion and disengagement is very wounding for teachers. The lights become dim for everyone in this environment, and the Ox-assembly line continues day by day. A teaching approach that goes beyond head knowledge and releases the unique passion in every student gives each heart a reason for learning that results in passion in the classroom. All the fundamentals, academic standards and testing are still present, but they are laid on the foundation of an awareness of that student’s heart’s desires… and, for those kids, it feels like love and respect. Life is breathed into the learning process. Teachers can authentically love and connect with their students at a heart level… by simply giving themselves permission to “hear” what’s in those developing hearts, what God put there! The learning journey of a student is powered by a bold and ambitious movement of the Heart. The Heart is driven by the Core of where their education will empower them. This is the WHY for them to claim their dynamic place in this world. Once the LION of the Heart is defined then the Work begins. But instead of being seen as work, it is now a passion of becoming prepared to dominate their WHY. This is the building and the skill acquiring; all driven by the Lion within them. Teachers who are driven by head-knowledge goals, performance, tests, repetition, and memorization usually alienate the students, disconnect their hearts, isolate themselves in failure and wounding, close their doors to collaboration, and then die in the classroom. Educators who are connected with their own hearts have an ability to connect with the hearts of their students and enable a culture of passion in the classroom that facilitates life-long learning & continuous growth. This actually results in better test scores, healthier students, pleased parents, enduring knowledge, and students motivated to reach their personal goals. These students will persevere to achieve their essential purpose in life, becoming productive, wise , and happy citizens. Common Core is the most recent example of a government sponsored, standard-based approach that assumes that every student’s potential is the same at the same time, and that the school is an assembly line. It makes student feel obligated to endless practice and performances at a pace which cultivates anxiety and burnout. Time and resources are limited to implement Common Core well; thus it reduces creativity and interpersonal connections for deeper learning out of the classroom. Music, arts, and relationships are typical casualties due to lack of time and money, all at the expense of passion and creativity. The ox-approach is putting something in the student; the lion-approach is recognizing that there is something already there and releasing it, unpacking their unique DNA of genius. David’s dream is to transform the education mountain. He’s invested time after-hours to develop the Heart Plan for other educators in his building on a weekly basis for the last five years. They, in turn, have used the concepts in their classrooms and personal lives. The concept is contagious as educators who meet with David go home and begin to release the hearts of their spouses, their friends, and their children. A door is also opening to carry the concept to a wider portion of the state of Oregon to impact other school districts. Currently, David is developing vehicles to improve positive change in the participating school districts by providing exemplary approaches to mentoring, consulting, and coaching educators in the latest educational research. David is currently a member and part of shaping this initiative for his region. Dream – What has God written in your Heart that you are passionate about; your Genius? Pocket goals – What are the practical steps you can take to make your dream come true? This includes identifying the skills and resources you need to build your dream. Heart Boundaries – What heart belief is holding you back; or adversity? What is there about your dream that makes exchanging the old belief for a new one a good trade for your heart? Who’s on your team – Who do you have to help you, mentors, team members, support? One of the practical and spiritual [core] secrets is helping teachers and students to get this process into writing. 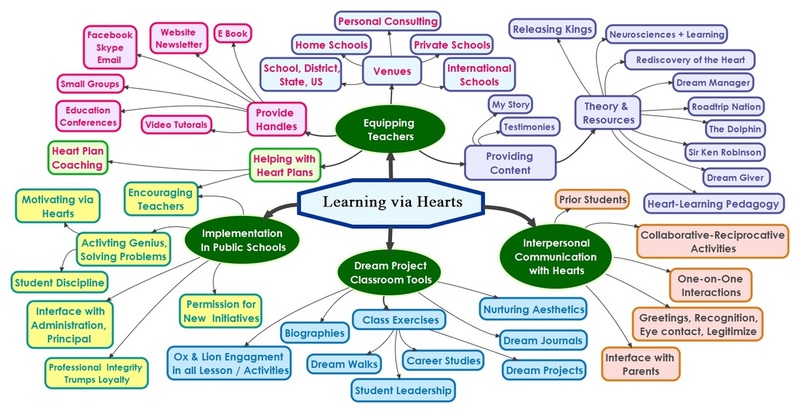 Our heart’s also “connect” with pictures (mind maps) of our dream as well. The result is that teachers don’t just know the names of their students and their academic progress. They also know something about the desires, the natural geniuses and talents in each of the students hearts (Where they’re headed) and they know the obstacles or fears in those hearts (What’s holding them back). They know something about what motivates each student. The book, the Releasing Kings conference in Hermiston and the friendship with John has given David permission to be a great teacher and to lead others to new Kingdom heights in the education mountain. His passion transcends every part of his life. This includes his family. At home, he and his wife Koi pursue and develop a family lifestyle which is conducive to raising children nurtured to follow the blueprint of purpose that God has laid on their hearts. One way they do this is a home meeting. In a family environment, David mentors youth & their parents to take hold of their kingdom place in today’s world though a diversity of teachings and activities. Rachelle also provides workshop time for the youth to practice dreaming together by sharing their talents and imagination through a variety of fun activities. David is connected with a macro vision for the Kingdom, yet is in touch with the personal hearts of each student and teacher with whom he connects. He’s having fun, and so is his family! If you are a teacher anywhere in the world, you can keep up with David’s progress, insights, and classroom examples on his Facebook pages and website. You may access his professional profile on LinkedIn. He is also open to Skype calls and emails. Along with his efforts in the local educational community, David is currently working with student educators internationally, and leaders of schools in Pakistan and Africa. If you feel a call to see acceleration in the kingdom for the education mountain, feel free to contact and network with David today.